London may be the home of the world’s best known monarchy, but in the tennis world, Paris has seen its share of coronations. Every May for the past five years, tennis fans, the international press and frankly the players, have trudged through the narrow paved pathways of Roland Garros, past the smaller dusty, red plots of Earth known as the outer courts expecting to see the familiar coronation. The King of Clay, Rafa Nadal, wielding his Babolat sceptre in his left hand, was the man, until suddenly, he wasn’t. Hey, winning the Australian Open and sweeping four of the year’s first five Masters events is a helluva way to siege the throne, no? Walking into Paris holding seven titles this year, Novak Djokovic had suddenly relegated the King of Clay to second favorite, or bare minimum,1A. Frankly, who couldn’t have forgiven the tennis world, even those who ought know better, for looking a bit past Nadal in their prognostications. I, among others, have questioned Nadal’s motivation to stay at the top of the game and keep winning titles he’s already won so many times. Monte Carlo, a seventh time? Ho hum. What did Nadal have to prove given his indomitable reputation on clay? Then suddenly, a strange thing happened, he wasn’t winning them anymore. What was supposed to be Rafa’s sixth trophy in Rome actually became Djokovic’s second title there. That third win for Nadal on his home, if not beloved, court in Madrid was also snatched away by the streaking Serb. Rafa won “only” two of the four clay court tournaments he entered coming in Paris. The No. 1 ranking he’d earned with one of the greatest seasons of all time in 2010 was suddenly and dangerously on the line. Then Rafa came to Paris, jumped on Court Phillippe Chatrier, center court of the de facto World Clay Championships, and went down two sets to one to big-serving American John Isner. Isner, seemingly unaware that Americans are not supposed to win anything in France but wars, nor that no one was supposed to beat Nadal in Paris, put a major scare into the five time champ. Nadal would win that contest and then even more inexplicably struggle against his unheralded countryman, Pablo Andujar (and by struggle I mean, Nadal didn’t utterly destruct him) in his straight sets victory. 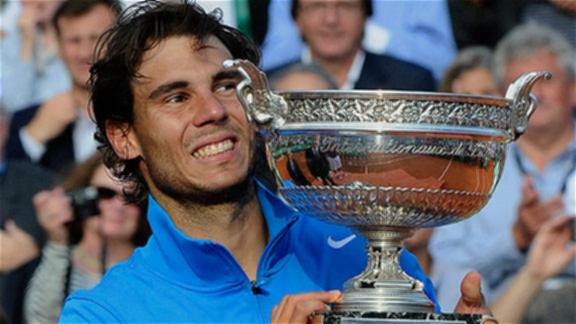 Nadal himself said he wasn’t playing well enough to win the French Open and the masses agreed. As Djokovic progressed through the draw with an air of inevitable invinciblility; Roger Federer looked as if he’d finally shaken the shanks. Nadal was workmanlike, getting through, if rarely approaching his best level. By the time Nadal faced Robin Soderling in the quarterfinals, every commentator and fan had read the tea leaves left over from Bjorn Borg’s reign at Roland Garros. Borg won six championships here, beaten in Paris only twice and by the same man, Italian Adriano Pannatta. Nadal was out to write his own history. Forgotten mid-tournament as a true contender, Nadal would sweep past Soderling, work his way past up-and-down Scot Andy Murray (himself a forgotten man coming into Paris) and rewrite history by toppling the arguable king of tennis kings, Federer, to win his sixth French Open crown. Nadal’s throne may have looked wobbly, but when the dust settled he would, for the sixth time in seven years, be the last man standing. We had learned new things about just how high Djokovic could go; we learned Federer wouldn’t fade quietly, but we subjects had forgotten our history. At Roland Garros, Nadal is the King, end of story. Vivez Le Roi! Roger Federer used to rule all corners of the tennis world outside of the red clay fortress held by the Spanish strongman. First, Nadal would pick off Federer on grass, then on hardcourts, suddenly Federer was a king in exile. With Djokovic beating all comers this year, Nadal, suddenly a tenuous No. 1 and a healthy Del Potro back in the mix, it seemed Federer was about to be erased from the conversation. Just before the scribes could finish their narrative, Federer changed the game. Even in his relative “decline,” there weren’t a lot of “bad losses,” but there were questions as to whether or not he could win another major, especially after Djokovic stormed back to beat him at the US Open where Federer is a five time champion. Federer eased through the draw, not dropping a set, but never inspiring anyone, but his most ardent fans, that he had could again be the absolute best. Beating Djokovic in the semifinals of the French Open was a statement win. First, it was a measure of well-timed revenge after losing to Djokovic in four of their last five matches (US Open, Australian Open, Dubai, a virtual home game for Federer, and Indian Wells). The win also abruptly halted the Djokovic assault on the record books, handing him his first loss since November. 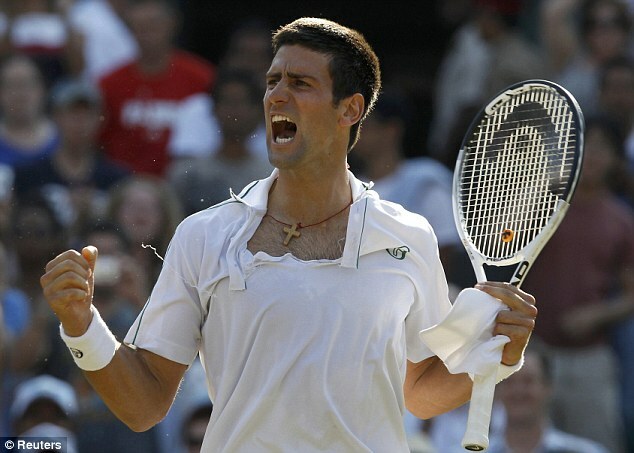 Even bigger, it kept Djokovic from that extra measure of legitimacy, the World No. 1 ranking. He and Nadal have owned the ATP rankings penthouse since February 2004. To put it in perspective, the last time one of these men wasn’t No. 1 was the week Facebook was founded. Federer didn’t win the title at Roland Garros, but he earned back a measure of respect. In turning back Djokovic, the heir apparent, and pushing Nadal to the brink, Federer ensured he wouldn’t be the forgotten man of the trivalry come Wimbledon. This run of form puts him right back in the mix. One last point here, with Nadal maintaining his long term lease on the Bois de Boulogne and Federer back charging at the gates, we can’t count out Djokovic. You don’t go undefeated for six months by luck, not at this level. It is all “coming together” for the Serb and the rest of his opponents are going to have to raise their levels to contend with him going forward. Djokovic may be licking his wounds ahead of Wimbledon, where he’s yet to show his best tennis, but forget about him at your own peril. If he can win 43 in a row indoors, outdoors on hard courts and on clay, he can win seven on grass. I want to reserve my final thoughts though for some people we’ve forgotten about for at least a year now, the women. This French Open had the air of a resurrection for the other singles draw. If you’re not WTA CEO Stacey Allistair or maybe Kim Clijsters, I think you would agree that since the Williams Sisters went into injury induced semi-retirement, Justine Henin and Elena Dementieva went the whole hog into the sunset and Maria Sharapova ripped up her shoulder, the women’s game has been rudderless, scattershot and snooze-worthy. First of all, Maria Sharapova continues to impress me. This woman is all guts and grit (OK, and beauty) and even though she was outsteadied by Na Li in the semifinals, by getting there she signalled that she is again ready to contend for major titles. Once a consistent, top five ranked, Grand Slam final weekend presence, this was Sharapova’s first semifinal since 2008. Just when we were ready to finally write her off, her performances here and en route to the Rome title a couple of weeks ago, prove there’s life in the (not-so) old girl yet. It was also a good tournament for longtime breakthrough threats Viktoria Azarenka and Anastasia Pavyluchenkova, but they’re still a day late and a dollar short in my book. Na Li, on the other hand, is proving to be forged of stronger stuff. She seems to be made to peak at the big moments, getting to the final of Australia and then basically getting lost in the Outback before resurfacing to win the big trophy in Paris. Li’s historic title, like those of Serbia’s Djokovic and Ivanovic or Spain’s Sanchez-Vicario and Brugrera, has the potential to radically change the face of our sport. As women physically mature younger than men, I don’t think the fruits of Li’s win in Paris will take long to be borne either. Suddenly, one sixth of the world’s population and a tennis federation that once held Li out of Wimbledon to play in the Asian Games just saw what’s possible. I will avoidthe temptation to overstate what the win could mean to women in China and Chinese sport as a whole, but I will say, it has given us all a reason to pay attention again to what in recent years, had become a forgotten part of the game. I predict in the coming years, that the women will receive a strong infusion of fresh blood from Asia, which has been largely silent to this point on the global tennis stage. Paris is a city that lives with its ghosts in plain sight, that remembers rather than renovates. Is it any wonder that this French Open has given us so many prompts to jog our own memories? Congratulations to the Champions, rest up, don’t forget, you’ll be at Wimbledon in two weeks. If military watches or chronograph watches are your recommendations. Most of their fake dior being sold have metal bands made of high quality materials, but there are some affordable ones with leather bands too. Whether you are a guy or a girl, you can discover fake hublot that you can utilize every day and match official occasions too. If military watches or chronograph watches are your recommendations, Invicta watch Invicta watches are a fine choice. First copy items of Bags, shoes, belts, clutches of famous brand hublot replica are also available at online stores. International brand products are neither easily obtainable nor fits into everyone's budget and this is one of the main reason responsible for growing popularity of replicated items. Online stores offer wide range of these products and costs are lowest possible. Shipping facility, guarantee of delivery, quality and privacy are favorable services offered by these rolex replica uk. It has possible to buy these fake louis vuitton bags especially for those who cannot afford to buy the original one.